A Labour donor is launching a legal challenge to the party's ruling that Jeremy Corbyn can be automatically included in the leadership ballot. Michael Foster, who donated £400,000, said he was worried about "apparent manipulation" of the rules after Labour's governing body voted 18-14 to allow the Labour leader on the ballot. His rivals Angela Eagle and Owen Smith need the backing of 51 MPs or MEPs. Labour deputy leader Tom Watson called the legal challenge "very unhelpful". The party's ruling National Executive Committee (NEC) had made a decision, he said, and questioning that was "destabilising" to the party. "We must respect that decision and give our members a choice of candidates as soon as possible," he said. The Labour leadership contest was sparked when Ms Eagle, who resigned from Mr Corbyn's cabinet, announced she was challenging her leader and secured the necessary nominations. There was a dispute over the interpretation of Labour's rules, and whether they allowed Mr Corbyn to automatically defend his leadership, or whether he would also be required to secure 51 nominations. After a reportedly highly-charged meeting, at which Labour's governing body considered legal advice, the NEC ruled in Mr Corbyn's favour. But Mr Foster, who stood as a parliamentary candidate in Camborne, Redruth and Hayle in Cornwall, said he was concerned that "everyone in the room had a different political agenda". He insisted his legal challenge was "not about politics", saying: "I'm simply concerned that this is an important issue. It's about the rule of law. "The advice given was certainly not given the expert consideration given by a high court judge." Mr Foster said three contrasting pieces of advice had been given by three different lawyers, and the matter must be considered by a neutral court of law. "When you conduct a membership association and it has a set of rules, you cannot, in Britain, a democracy that stands or falls by application of law, bend the rules to suit a particular circumstance or particular position," he added. He expected a court to hear the case within days, he said. 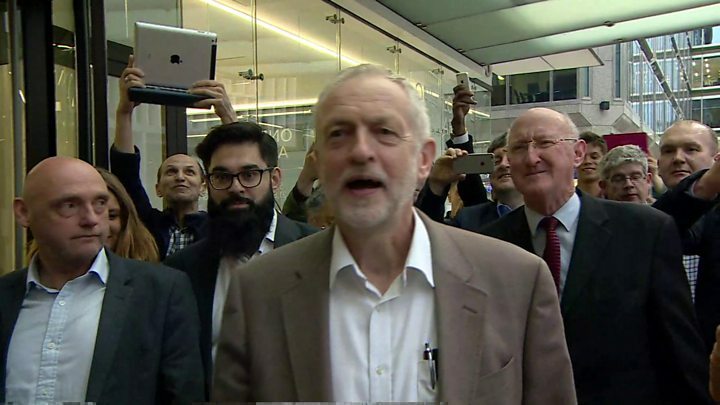 Speaking after Tuesday's decision, Mr Corbyn said he was "delighted" and would fight to keep his position. Ms Eagle said she welcomed the contest and was "determined" to win. She said she had eventually decided to launch a formal challenge because Mr Corbyn was unwilling to stand down and she could provide the real leadership he could not. On Wednesday, Owen Smith, also a former shadow minister in Mr Corbyn's cabinet, announced he would also run. 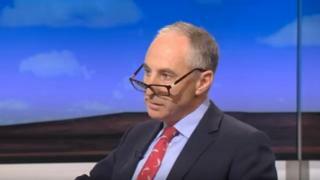 The Pontypridd MP, who quit as shadow work and pensions secretary last month, said he could "heal" the party and "turn the page" on its internal strife.